This walk will take about two and a half hours at a steady pace, but longer if you want to stop for any reason above. There are a couple of short climbs and two stiles, but it is easily achievable by any moderately fit walker. Start at La Collinette the crossroads at the top of Harbour Hill, where the horse carriage trips start and many gather to consider how to pass their day in our glorious island. Take the left turn from the horse carriages and follow the road which descends to a sharp bend. Turn right here, along a little lane marked ‘Pomme de Chien Campsite. The steep banks of this lane are a showcase of wildflowers in spring and early summer and as you follow the right angled turn the meadow on your left can contain many lovely species – pale flax, red clover, sheep’s sorrel, vetch, buttercups and ox-eye daisy. The lane descends into woodland, until the trees are meeting above your head. Look out for a sharp turn into the woods, with a marker saying ‘Dixcart Bay’. These woods are magical at bluebell time, April to early May and beautiful at any time, with towering trees, many ferns and birdsong. The path is narrow and can be slippery if wet. You pass the gable end of a house which seems to be deep in the woods. 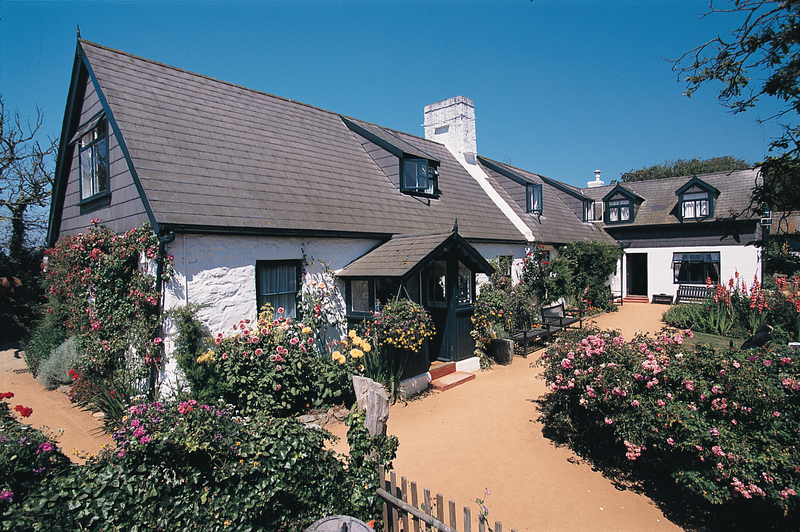 This is Petit Dixcart, one of the 40 tenement houses built at the time that Sark was being settled by Helier de Carteret and the families he brought with him from Jersey in the seventeenth century. Crossing a small bridge you walk by the stream for a while until you reach a fork. 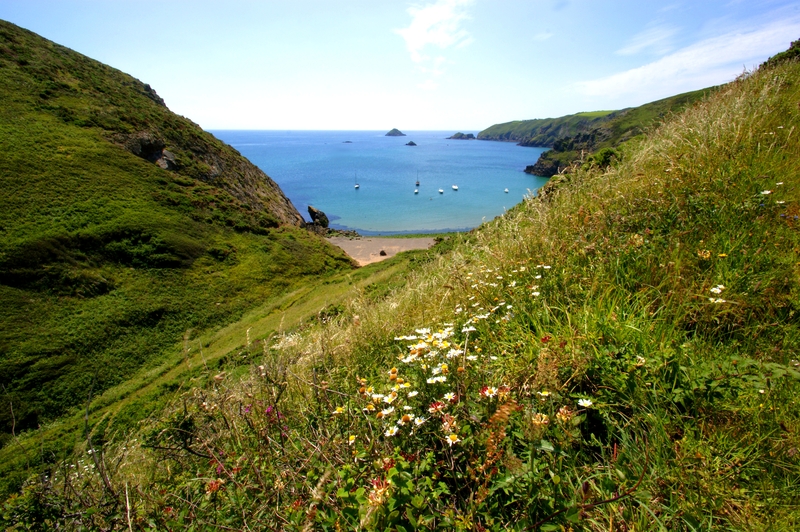 Down to the left leads you to Dixcart Bay, but we turn up, slightly to the right and rise quite sharply. There are good views down to the bay and two conveniently positioned benches near the top provide an excellent stop for a breather. Stay on this path as it winds upwards and notice, on your right a small memorial to Major JG Appleby and Operation Basalt, 3-4th October 1942. When you come to a stile on your left with a signpost for ‘La Coupée’, use the stile and take the path along the side of the field until you reach another stile which takes you on to the cliff path, sometimes called the Pendant. Was there a hanging there in the distant past? No one knows. Initially you walk between high hedges of blackthorn and ivy. The blackthorn bushes are snow-white with tiny blossoms in March and later in the year we find the tiny black sloes so prized for making sloe gin to recipes kept secret in order to take a prize at next year’s agricultural show. The path opens up on your left to reveal lovely views down to Dixcart Bay and another bench nestling in the hedgerow on your right offers a welcome stop for a picnic. The house you can see far over to the left is La Jaspellerie, which featured in the 1986 film Mr Pye, based on a novel about Sark written by Mervyn Peake (published 1953). The predominant flowers in this area are honeysuckle and red campion, which tend to flower from late spring well into midsummer. Look right towards the conical shape rock called L’Etac, home every year to a large breeding colony of puffins which you can see close up during a boat trip around the island with George Guille. The path descends into more woodland and then follows the cliff, with open views towards Little Sark, the headland of Rouge Terrier and the rocks of Brenière. 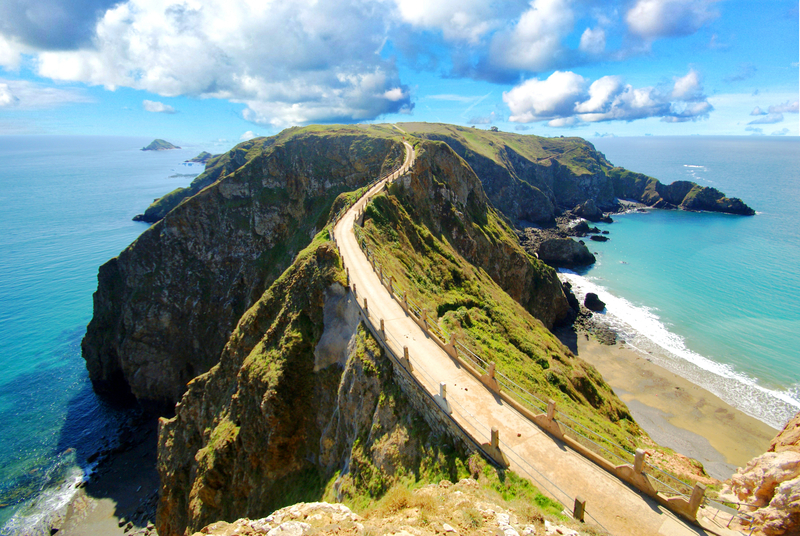 As the path winds to the right you can catch your first tantalising glimpse of La Coupée, the narrow isthmus that links Big and Little Sark. But before joining the road to cross La Coupée, walk to the left, where a sign warns of a sheer drop ahead and if you have a head for it, stand and look down on the road which now has railings, take a photo and imagine how it was in days gone by, when it is said that the children used to crawl across on hands and knees on stormy days in order to get to school. Take your time on La Coupée, there is lots to see. The sandy rock enclosing you on the descent and ascent is home to many small plants, bright blue sheep’s bit and pretty pink thrift, creamy sea campion and the bright yellow bird’s foot trefoil. On your left the rocks form a precipitous wall down to Convanche Bay, to the right you look down onto the sandy bay of Grande Grève. You will see a mass of pinkish powdered rock to your left, from a huge landslide in the winter of 2008, when much of the path down to the bay was swallowed up. A path has been restored and remade by local volunteers, but it should be only used with extreme caution. Looking across the sea from here you have an excellent view of Brecqhou, an island which is part of Sark and separated from it by the narrow Gouliot Passage. Beyond is the cone shape of the island of Jethou, which is inhabited and in sunshine you will see the golden sands of Shell Beach on the island of Herm, one of the best places for a warm swim in all of the Channel Islands. The plants on the slopes of La Coupée are mainly salt tolerant species, as a salt-laden wind can funnel up from below. You can see samphire and more thrift. Cross over La Coupée and follow the road with banks either side full of flowers, and in the summer butterflies, for twenty minutes until you reach La Sablonnerie Hotel and Tea Garden (toilets here for customers). The Perrée family acquired La Sablonnerie tenement in 1946 when the building was a tumble-down farmhouse, and it has been a hotel since 1948 when it’s story began. 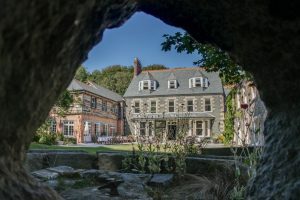 You can eat a famous Little Sark lobster lunch at a table outside in the pretty hotel garden or inside in the hotel restaurant. Just across the road on the right is the tea garden which serves delicious light food from morning till evening, including a lovely Sark cream tea. For visitors who prefer a relaxing journey, the hotel has its own horses and carriages. Back on the T-junction outside La Sablonnerie, take a left and continue down to the tiny Hamlet which is the heart of Little Sark. You will see lovely little cottages, mainly unchanged in a very long time, which are inhabited. These mark the end of this road (although there are paths which lead from here around the coast of Little Sark). Turn back on yourself, and before you reach La Sablonnerie again just look through the gateway on your left, to see the ruins of the old Windmill of Little Sark. It is covered with ivy now and makes a brilliant shelter for resting horses! The windmill stands on La Pipeterie tenement, was built around 1800 and ran for a short time. In 1835 the tenant of La Pipeterie leased his derelict mill tower to Sark Mining Company to be used as a furnace, however there is no evidence it was. It does make a good photograph these days though! Continue on the road on which you entered Little Sark, heading back over La Coupée, and up the incline off the causeway. Just over the brow of the first hill you will come to Caragh’s Chocolates on the left hand side, which is situated in a handsome granite house (toilets here for customers). You will also find a café where you can have a drink and piece of cake. Pop inside and take a look at the chocolates being made. Caragh has been producing chocolates since 1992 in the same way, and sends them all over the world. You can choose from dark, milk or white chocolates with different fillings and shapes. You can even treat yourself to the contraband selection, especially for grown-ups! The chocolates are made on site, with the freshest Sark cream. The road continues downhill. On your left, you will see a gateway through which you will get a stunning view over the valley above Port es Saies, with Guernsey on the horizon. You will also see the lovely group of houses at Dos d’Ane to the right. At the bottom of the hill you will find L’Espace Gallery owned by Annie Dachinger, on the left. Continue a little further and take the next right turning, which is signposted to Stocks Hotel. Take the pretty, shaded lane down to where the road forks. You will see the grand frontage of Stocks Hotel on the left, which underwent a total refurbishment and was completed in 2011. Take the left route and BE CAREFUL! The surface is bumpy and unpredictable here. As you round the corner and continue onto the cobbles, you will find an entrance to your left which takes you to the front of the Hotel (which leads to reception and the Bistro) and to the bar entrance. Here you can stop off and enjoy a drink in the garden, or a delightful lunch in the Bistro overlooking the pool to the side (which as a customer you can use). Stocks has been an integral part of Sark history for centuries. There is evidence of old monastic buildings on the site dating from medieval times. 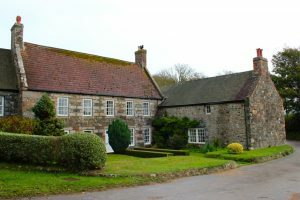 The oldest of the current buildings date from circa 1741. 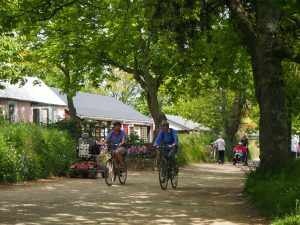 The original farmhouse was built in a central, sheltered position close to fertile land and one of the most reliable wells on Sark. In 1895 the property was significantly extended and converted into a farmhouse with rooms by Thomas Godfray, who was Seneschal of Sark for many years. The hotel takes its name from Mr and Mrs Harry Stock who owned the property in the early 1900s. During the Second World War Sark and Stocks were occupied by the German army. Officers, including the Commandant, were billeted at Stocks between 1940 and 1945. Allied commando raids were frequently made via Dixcart Bay and along the valley below Stocks. Now continue along the cobbled path out of Stocks. Just before you come out of the wooded area look to your left, and you can see where the entrance to the Second World War German tunnel begins. It is now very overgrown. In the spring, this area provides a stunning vivid blanket of bluebells. Wild Garlic is also prevalent in these woods in spring. At the top of the path in front of you is Le Manoir, the original home of the first Seigneur of Sark Helier DeCarteret who, with the permission of Queen Elizabeth I, came from St Ouen Jersey to settle on Sark in 1565. In return, his obligation to the Queen was to ensure the island’s future safety from attack by pirates by retaining forty armed men and to pay a 20th of a Knight’s Service Fee, which the present Seigneur still pays to the Crown at Michaelmas. To fulfil this obligation Helier de Carteret divided Sark into forty pieces of land, known as tenements, which have remained much as they are today. He leased thirty-nine of these in perpetuity as feudal holdings to the colonising families, mostly from Jersey and Guernsey, keeping the fortieth in the centre of the island for himself. Le Manoir is built in the style of a typical Jersey farmhouse and although most of the original exterior façade has now been replaced, 4 horizonal diamond shapes called Fusils, signifying the DeCarteret coat of arms, can still be seen in the stone work on the left of the main house roof. There was an old chapel inside the main house. 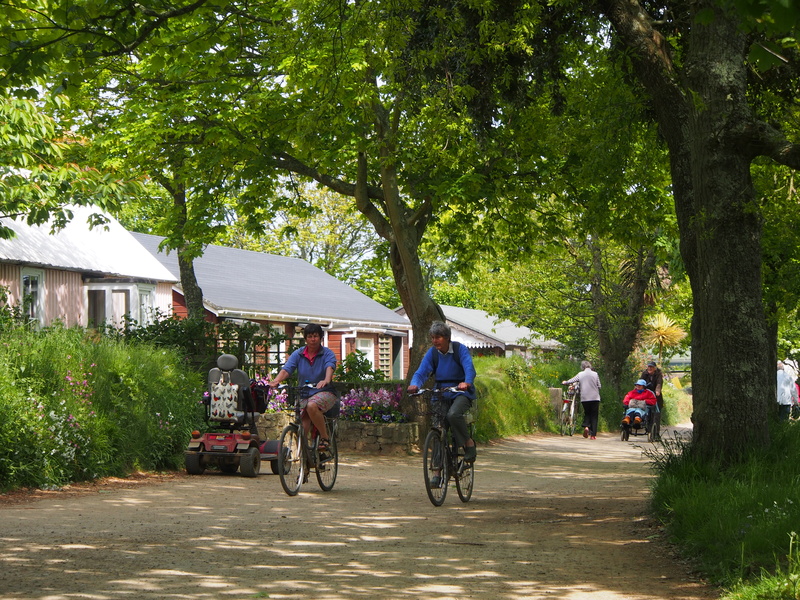 Take the road past Le Manoir and round the corner where you get a charming view of the Helier cottages. They remain very much unchanged to this day. Up the hill you can see the Cider Press Barn on the left. This forms part of the Heritage Museum run by the Société Sercquaise. 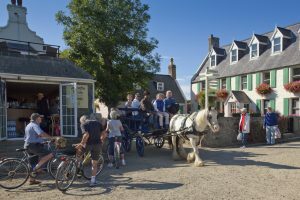 It was fully renovated in 2014, and now houses exhibitions as well as important Sark archaeological finds. If the door’s open (or peep through the window) you will see the beautifully cobbled floor, compiled from pebbles from the beach at L’eperquerie (the north-east area of Sark). Opposite, you will see the entrance to the Visitor Centre. This is the island’s official Visitor Centre, and you will find a wealth of information, booklets, details of events etc. as well as a little shop. The helpful staff can advise you on what to do and see during your stay and there are informative exhibitions held here between March and November. This pretty little building was built as the girls’ school in the 1840s, then it was a mixed school which it continued to be until the new Island Hall and School building was opened in 2004. 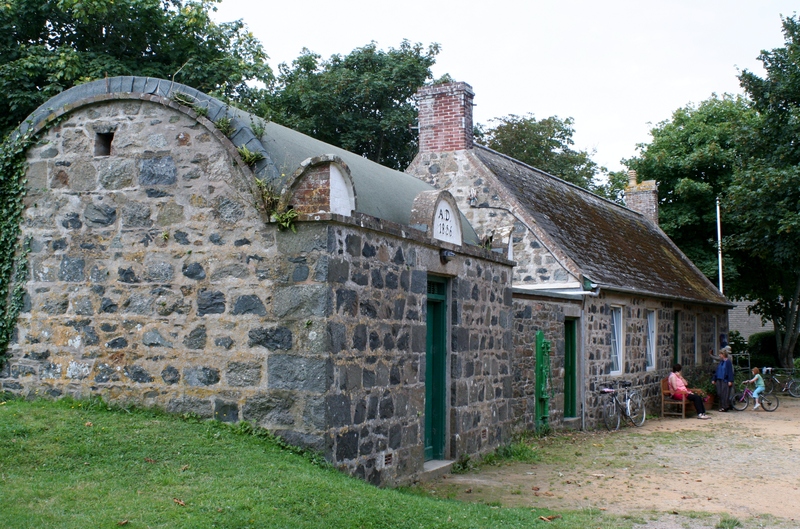 During the occupation of Sark between 1940 and 1945 the building was commandeered by the German Army and used as a medical room. Old gravestones and bones found during the digging of the foundations here point to the site perhaps being a medieval cemetery. To the right of the entrance to the Visitor Centre you will find the Heritage Museum run by La Société Sercquaise. This is open between April and September, managed by local volunteers. Housed next to the Visitor Centre are the public toilets. Fleur du Jardin is open every day through the summer months, and Harry was delighted to be the voted winner of our Cream Tea competition in 2015 by visitors to Sark. Here you can have a simple sandwich, or go for a delicious local sea food dish of crab, lobster or scallops. The restaurant has been in Harry’s family since 1985, when he built it up from what was just the Arsenal building. Enjoy sitting out in this sheltered, colourful garden and watch the world go by. 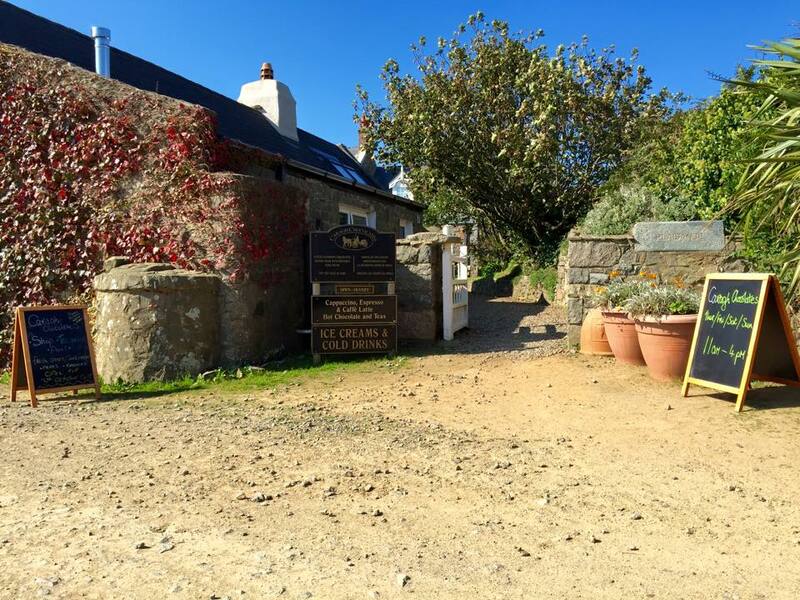 A lovely spot in the heart of Sark. The last leg of your walking tour takes you back on the road towards the village, to the right as you leave the garden. This is The Avenue, so called because it used to be completely tree-lined and had far fewer buildings. As you walk, look to your left to see the Gallery Stores and Post Office. This was once a 1930s artists’ studio and gallery, hence the name. Mervin Peake, amongst others, used the second floor through the round window above the door. It has been the current Post Office since 1961. In the courtyard outside you will see our one-and-only post box, painted gold to commemorate Carl Hester (originally from Sark) winning Gold in dressage in the 2012 Olympics. Normally the post box is dark blue, like the ones in Guernsey. Down The Avenue you will find a food shop, souvenir and gift shops, and a pottery studio run by Lorraine Nicolle (to the right before Food Stop). At the end of the road you can find a café, Petite Poule (toilets for customers) with a lovely courtyard area opposite. This brings you back to La Collinette and the end of your walk. Just down the hill ahead is where the ‘toast rack’ Harbour Hill transport takes you back to the boat, just next to the Bel Air Inn.